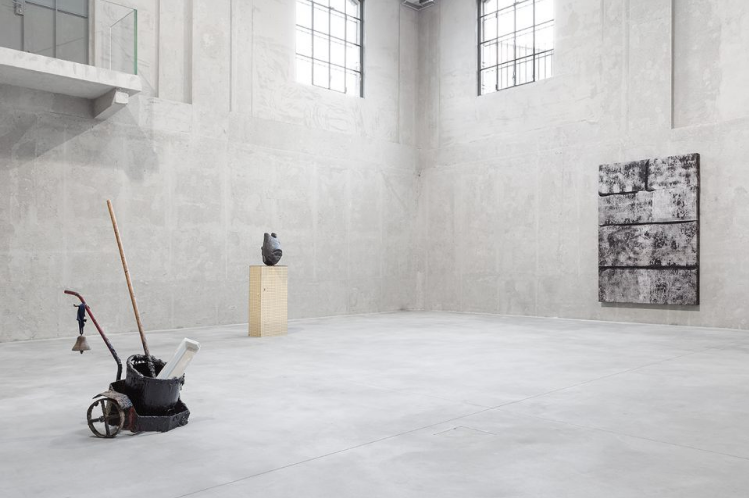 “True Value” —the first exhibition by Theaster Gates (Chicago, 1973) in Milan— brings together a selection of existing works and new commissions in two different spaces at Fondazione Prada. The Cisterna features works in which the artist explores habitual, everyday things, immersed in the most evocative Black aesthetics. Gates operates on the conviction that everyday objects convey a deep understanding, not only intrinsic to their material aspect, but reminiscent of the experiences in which they have been immersed. In that sense, discarded materials involving collective memories constitute the catalyst for a political and aesthetic reflection on cultural renewal and social activism. Fire hoses used against demonstrators during the US Civil Rights movements in the 1960s or gym floors from dozens high schools closed and fallen into oblivion, swept under an unbeatable neoliberal economic agenda, turned into artworks in which formalism is not just a mere visual factor. This transformative ethos, from which a symbolic universal value emanates, is key in Gates’s practice. These everyday objects, together with other items and elements referencing more ritualistic and spiritual experiences, shape the proposal offered to the public in the Cisterna. On the first floor of the Podium, Gates hosts True Value (2016) —the installation after which the exhibition is named— which presents his rendition of an abandoned hardware store. True Value gathers materials, objects and tools removed from their original context and relocated in an art environment, deploying a framework to formulate a poetic and pragmatic space around objects of trade and human relationships those economic and labour exchanges create. The exhibition is a further opportunity to explore certain nearby cultural and commercial entities, observing local stories, socio-political patterns, and economically and culturally under-explored communities in the hope of setting in motion a new cartography through which to visit and engage an overlooked Milan. Lastly, in a space in the likes of an artist’s studio or craftsman’s workshop, artworks created throughout the duration of the show will be on display. The exhibition spaces will host a series of public meetings, titled “True Value in conversation”, by means of debates and readings. The first meeting will be held on the first floor of the Podium Thursday 7 July at 6 pm and will open with a gathering between Theaster Gates, Elvira Dyangani Ose and Thelma Golden, Director and Chief Curator of the Studio Museum in Harlem, New York. Notably known for exhibitions such as “Black Male: Representations of Masculinity in Contemporary American Art” (2014) and the 1993 edition of the Whitney Biennial, Thelma Golden will join the artist and the curator of the show “True Value” to discuss art and its capacity to transform institutions, history re-writing and social practice. Admission is free. Complimentary tickets can be collected at the ticket desk from 5.30 pm. Gates’s practice embraces a wide range of disciplines and a variety of artistic vocabularies – sculpture, painting, installation art, music and performance – as well as urban development and social practice. Starting on the South Side of Chicago, St Louis and Omaha where his first initiatives on art and social activism took place, Gates has subsequently advised individuals and organizations in other US cities (Detroit, Akron, and Gary, to name just a few) on how to conceive and carry out initiatives aiming to regenerate deprived urban areas by merging pragmatism and creativity, urban planning and “artistic gestures”. Internationally, Gates has also reflected on the capacity of art to renew traditions, upraise connectivity among communities or set up dialogues and exchange cultural heritage among cities through his projects, such as those in Istanbul, Bristol or Kassel. Some of his propositions have generated solid institutions, such as the Rebuild Foundation. Gates holds a chair at the Department of Visual Arts at Chicago University where he supervises the Arts and Public Life program. As Elvira Dyangani Ose says, “If there is a particular ethos that has characterized Theaster Gates’s work in recent years, it is the formulation of the unimaginable as a common cause. It would be a misconception to believe that his attention to urban regeneration, social practice and blackness engages only the communities that his projects affect immediately. Instead, Gates’s immaterial gestures – as much as the objects he produces and the experiences he generates – are essentially a ‘call to arms’, raising awareness of the need for what American theorist and poet Fred Moten calls the ‘coalition’, or the recognition that what affects those communities subsequently affects the rest of us too; the acceptance that we are all in this together”. “True Value” will be accompanied by an illustrated publication in the Quaderni series, published by Fondazione Prada, consisting of two interviews with Theaster Gates by curators Elvira Dyangani Ose and Niccolò Gravina.